Love &apos;em or hate &apos;em, tall or extra-long tees were one of the most ubiquitous trends of the mid-2000s. In an ode to the controversial trend, we look back on an incredibly informative 2005 Baltimore City Paper story about the history of the beleaguered style. Henry Abadi, a Syrian native who fled to New York in 1971 and was trained as an engineer, seems like an unlikely source for the tall tee, but with a bit of help he eventually became the style&apos;s go-to supplier. Abadi first opened a children&apos;s clothing store after not being able to get work as an engineer. With the success of the store, Abadi spun that off into a wholesale business, Harvic International. At first, Harvic traded in cheap sneakers from China that Abadi would print "Galaxy" on the side. Abadi expanded his wholesale business to the exaggerated T-shirt style in 1985, based on a tip from a friend who worked as a buyer for a department store. The 40-inch tees, as they were known in the industry, brought a new wave of customers to Abadi&apos;s business, however, it wasn&apos;t who you would expect. Retailers originally purchased the tall tees as "dorm shirts" for women who were seeking something comfortable to sleep in. The dorm shirt business was booming during the &apos;90s, but fell out of favor as the century turned. Abadi stopped ordering the tall tees until he received a wholesale inquiry from a store in Newark, New Jersey that wanted 1,000 of the now out-of-favor tees. Abadi had a hunch that wouldn&apos;t be the last order and purchased a whopping 60,000 more to his supplier in China. He was tipped off by Joseph Steiner, the owner of the Newark store and a man who prided himself on his trend-sensing abilities. Steiner is a Hungarian immigrant who provided some colorful commentary on the desire for the tees. "Why they like the T-shirt long?," Steiner told Baltimore City Paper. "I have no clue. They want it, so we get it. There’s your answer. I only wish my beytzim were so long." Beytzim being the Yiddish word for testicles. 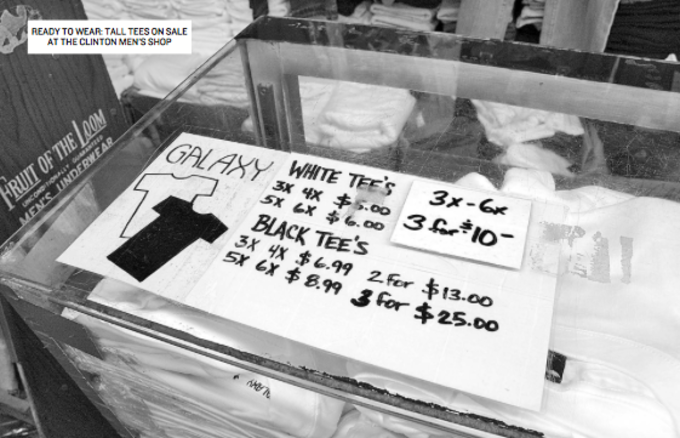 Galaxy started receiving calls nationwide for the tall tees and and its chief salesman at the time, Eli Cohen, pegged annual sales for the style at somewhere around three million. Galaxy became known as the supplier for tall-tees, and Abadi proved as much by getting the opinion of a local kid who was wearing one. "Tell me, my man, tell me what you’re wearing," Abadi recalls. "The kid says, &apos;Galaxy. Only the best.&apos;"
However popular the style was they were reviled by retailers and quickly became associated with gang culture. Retailers reported that because the extra-long tees were so cheap it didn&apos;t matter how much they sold—it was impossible to make a profit off of them. Some say that the trend started explicitly because people wanted to look the same. "If the cops are looking for a suspect, [he’s invariably wearing a] long white T-shirt with long shorts," Stuart Silberman, an executive at a retail chain named Changes, told Baltimore City Paper at the time. "So they can’t be identified. That was the real reason it all started." The tall tees origin&apos;s eventually backfired on it though as people began avoiding the style in fear of being profiled or mistakenly arrested. Plus, with the late-2000s charge of more form-fitting clothing, it was only a matter of time before the original baggy T-shirt was phased out of most dude&apos;s rotation. It&apos;s hard not to see a resemblance though to tall-tees in the better-fitting styles sold by brands like John Elliott + Co. These new long T-shirts dip down below your waist without losing its fit in the waist and chest. So, maybe the tall-tee isn&apos;t dead so much as it is reincarnated for the modern day.